This credit card-sized ZEN has a stunning 2.5" color screen and is perfect for music, videos and photos. 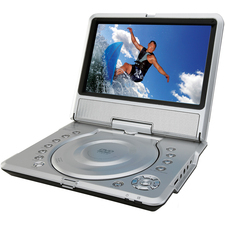 Enjoy up to 1,000 MP3, WMA or AAC songs, watch up to 15 hours of videos and share hundreds of photos with your friends. Even expand your portable music, video or photo collection by adding additional content through the convenient SD memory slot. 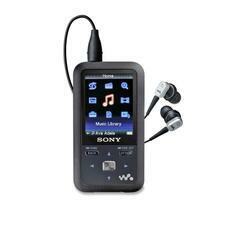 8GB Walkman Video MP3 Player allows you to relax on an extended flight or work at your desk with the tranquility of noise-canceling headphones included with this player. Headphones use the integrated active noise-canceling system to reduce outside noise and deliver dynamic-range playback. 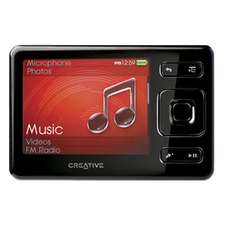 Listen to music in a variety of file formats, watch a video on the 1.8" QVGA LCD, or enjoy the radio via a built-in FM tuner with 30 station presets. Slim-line player easily fits in your pocket. 8GB built-in memory can store up to 1,850 songs or up to 30 hours of video. MP3 player includes a long-lasting battery. 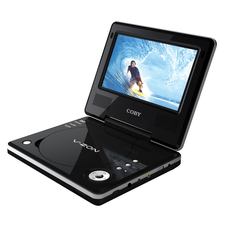 This credit card-sized ZEN has a stunning 2.5" color screen and is perfect for music, videos and photos. 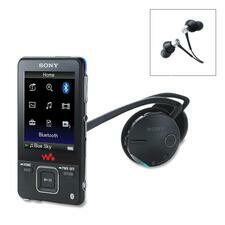 Enjoy up to 2,000 MP3, WMA or AAC songs, watch up to 30 hours of videos and share hundreds of photos with your friends. Even expand your portable music, video or photo collection by adding additional content through the convenient SD memory slot.